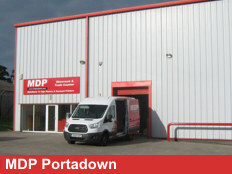 Our Portadown branch is conveniently situated just off the main Portadown / Armagh road, 5 minutes drive south west of Portadown centre. We have the latest machines and products on display and our staff will only be too happy to assist, advise or take your order. Below there are brief directions. For full detailed driving directions please see the AA Route Planner website. To see an area map by Google click here. After you see Portadown railway station on your right get in the left lane and take the road signposted Armagh. Take first road left and we are at the end of the road before it bends round.